It's been wedding whirled around here lately. 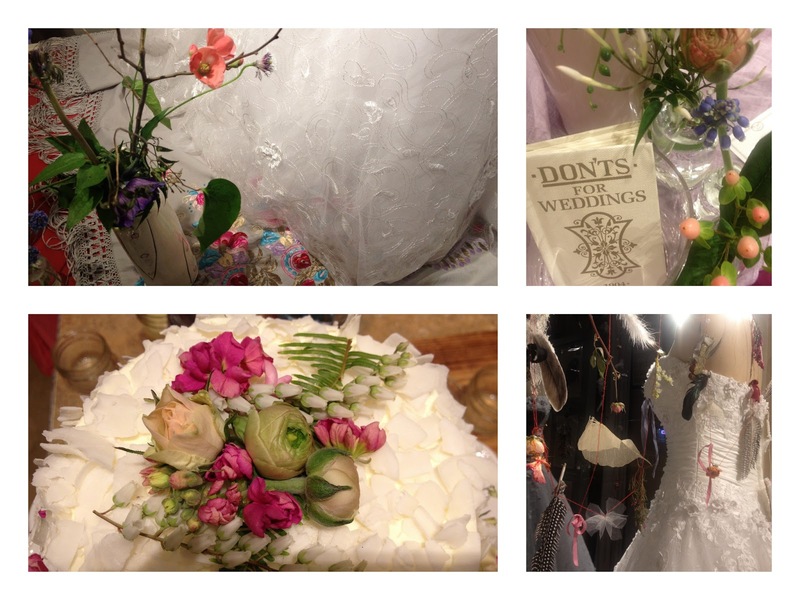 Last night, we had a fun , homegrown bridal show called Brides on Broadway with lots of our friends and downtown neighbors. And that's pretty big for me since I mostly feel allergic to bridal shows. One hint of white lattice and purple nylon and I start to feel a little headache coming on. This felt authentic and real. And it gave me the chance to put a big ole wedding dress right in the front window which I have always wanted to do. 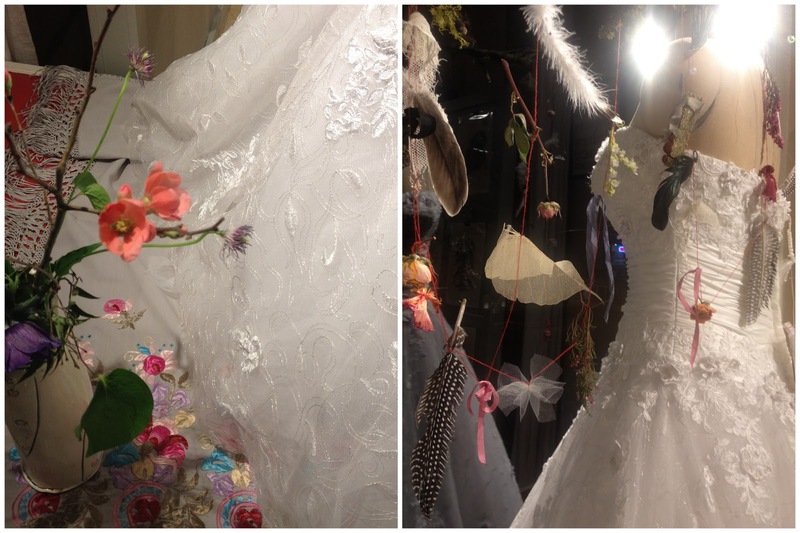 Blush Bridal Boutique was kind enough to lend us one. 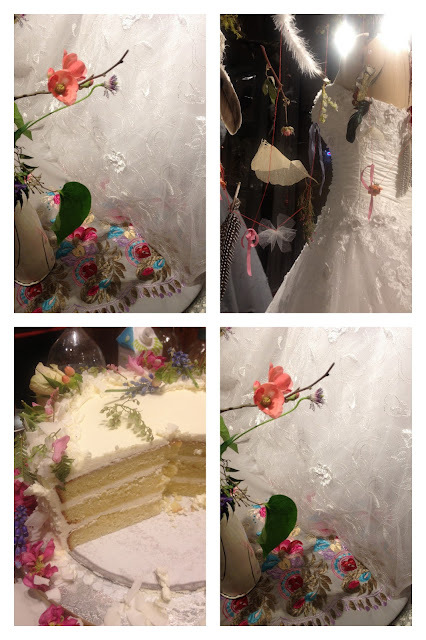 We had designer cocktails and cake to nibble and took lots of pretty photos. Thanks everyone for bringing it. Party Cart, Red Wagon Creamery, Jane in the Woods Photographie, Charm Bracelet Rescue Project, and Noisette Bakery, it wouldn't have been a party without you. Plus all my fun downtown neighbors kept it hopping. Find out more by checking out the Brides on Broadway Facebook page. And yesterday Style Me Pretty featured a Passionflower wedding that Sarah did the flowers for at Mt Pisgah last summer. Which by the way I just think is a wonderful spot to get married. If you're lucky some deer might come out and join your wedding party. I've seen it happen at more than one event there. You can check out the Style me Pretty link here. It was an unexpected surprise to hear from them. And next week we're making 10 bouquets for the Luxe Bridal Event at the Hult Center. Let us know if you'd like some free tickets because we can make that happen for you~! In the meantime, it would just be lovely to have some real life brides come in and order flowers for their wedding. Because, we need something to keep us busy this summer!